Summary. The pictogram transfers the ETC instruction about urgent necessity of our civilization’ dematerialization from the level of global cataclysms, where we live now through the united consciousness. This need is due to the critical weakening of Earth's magnetic field. Extraterrestrial civilizations constantly warn about the occurrence of the first of three pre-cataclysm in the near future. 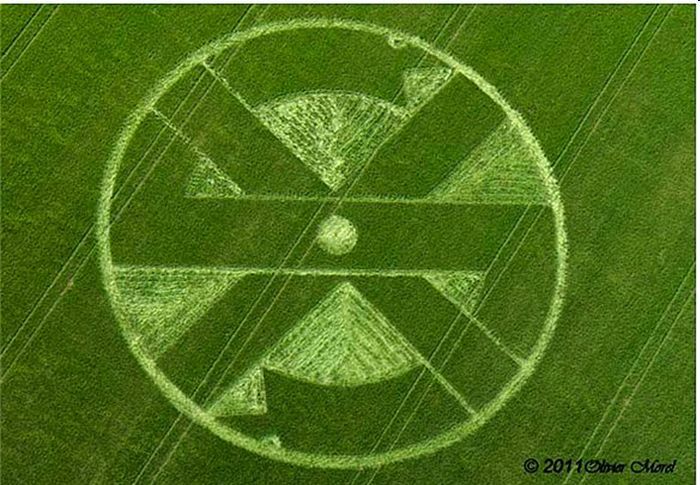 This information about the occurrence of pre-cataclysms is presented in our decoding of the pictogram June 20, 2011, Stonehenge, Wiltshire. The pictogram is repeated four times enlargement of the brain areas of cells. This expansion occurs only in one case - when combined consciousness is formed. 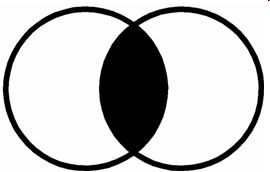 So, the pictogram shows that it is necessary to organize the unification of civilizations’ consciousness. The principle of unification of consciousness: at association of two or more people consciousness two or more individual cells form a common cell of the united consciousness with expanded brain area. Individual cell is a representation of individual in the information world. In ETC symbolic the Principle of the united consciousness looks so. This process is represented by four halves of the cell (red color) with already expanded brain areas, which means the initial united consciousness. Hence unification of consciousness is already familiar process, because on the planet has been repeatedly held, and holding numerous collective meditation and other activities of the association of consciousness of millions of people around the world. 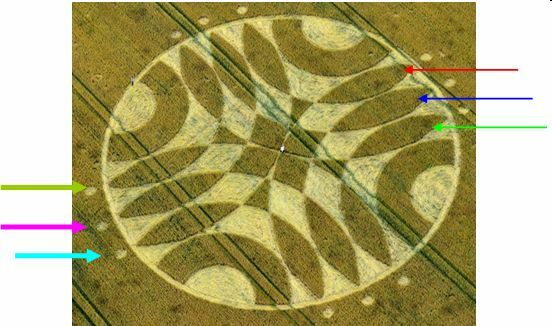 Concentrically expanding circles (green, pink, blue) means joining a growing number of people for unification of consciousness until this process does not cover the whole civilization of Earth. However, at the expansion of information cells’ brain areas their imposition occurs, and arise a pointed oval of dematerialization and the Transition. Appearing of the pointed oval means a body transformation. For a body transformation it is necessary to transfer through parallel worlds of the material world. Just this way by teleportation ETC fly through the universe overcoming millions of light years. Humanity of Earth is not able to transform body yet, because of a low level of consciousness. That's why extraterrestrials are flying out from galaxy to galaxy, and we - only till the moon. 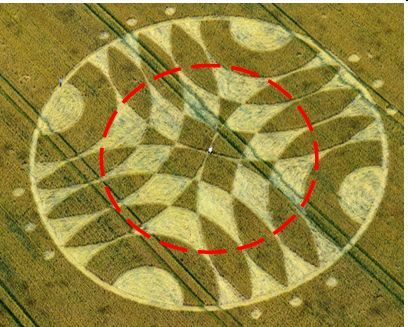 Depicted nearby three ovals of a body transformations (three thin ovals, arrows on the right) inform that together with us will undergo conversion three previous level of consciousness included in the individual cell of human being also. 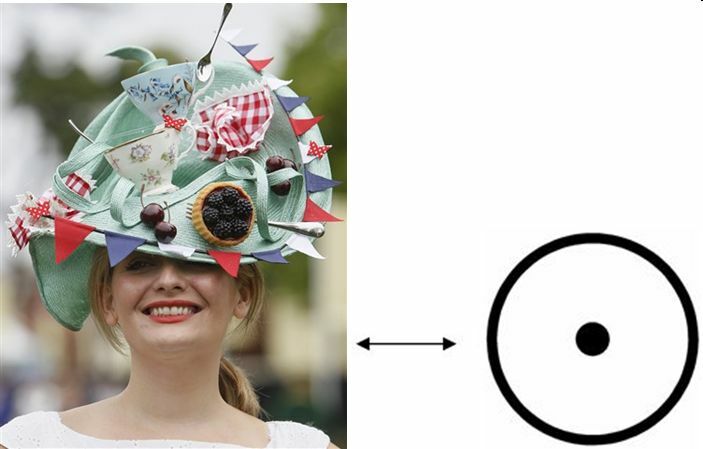 Brain areas of individual cells are shown by small circles behind a large circle (three thick arrows on the left). However on the pictogram these symbols of magnetic field are barely visible. 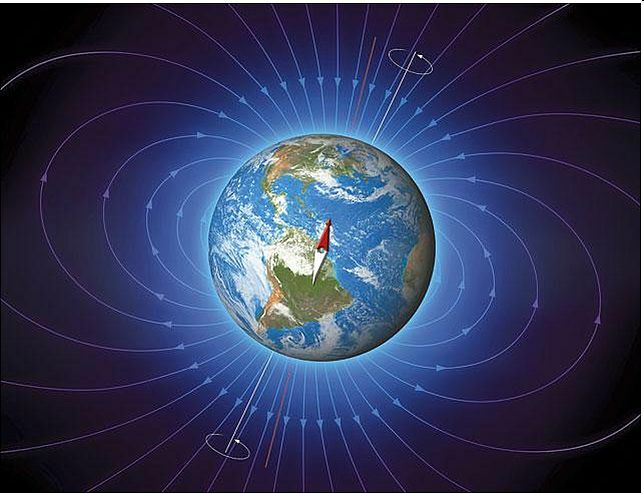 It points on a weakening of the critical magnetic field of our planet. Thus, the pictogram transfers the ETC instruction about urgent necessity of humanity dematerialization from the level of global cataclysms, where we live now through the united consciousness. This need is due to the critical weakening of Earth's magnetic field. Summary. The pictogram informs about the beginning of global cataclysms as a result of critical weakening of magnetic field. Through the pictogram ETC transfer the instruction about urgent necessity of our civilization to dematerialize from the level of global cataclysms, where we live now. Humanity has to make the Transition to the safe level of the material world for prolongation of life through the united consciousness of all civilization. 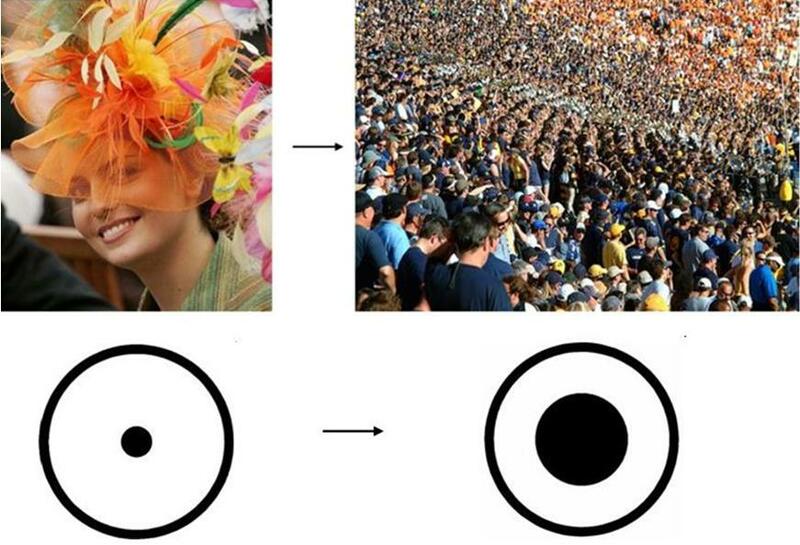 In the pictogram information is transferred by the main ETC analogue and digital symbols of consciousness. Information cells of individual and united consciousness, pointed ovals of the dematerialization and the Transition, and also digital symbols informing about three previous levels of consciousness included in the individual information cell of human being. 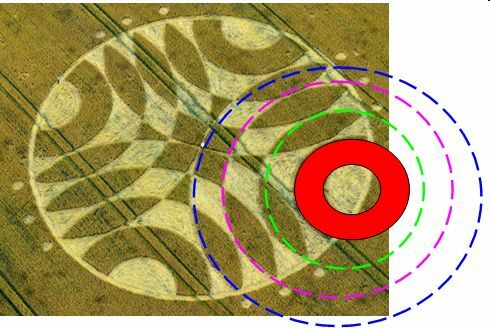 Critical decreasing of Earth's magnetic field – cause of global cataclysms beginning is presented by Earth magnetic field symbols – rhombs and rectangular shape figures in chess board order. Ancient complex of Chan-Chan in Peru point inform that life of mankind totally depends of condition of Earth magnetic field. Moreover, complex Chan-Chan confirms that humanity is like fishes in the net of magnetic field of Earth. Pictogram gives instruction for change of consciousness mode from individual to the united. Our Transition will not affect nobody’s private property. Extraterrestrial civilizations constantly warn about the occurrence of the first of three pre-cataclysm in the near future. The pictogram June 20, 2011, Stonehenge, Wiltshire is a warning about the first pre-cataclysm coming soon as an extraordinary event in the physical world which surpasses all natural powers known by humanity. 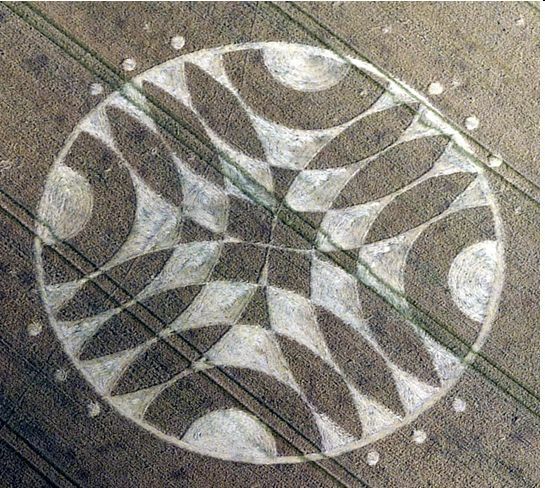 http://www.cropcircleconnector.com/2011/stonehenge/articles.html. Pictogram June 20, 2011, Stonehenge, Wiltshire also gives instruction for change of consciousness mode from individual to the united.